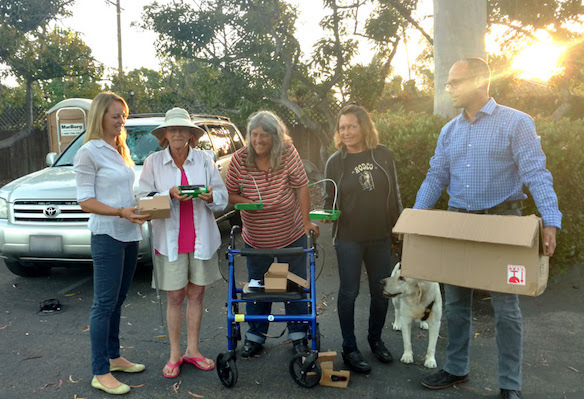 New Beginnings Counseling Center’s Safe Parking program is the recipient of 20 solar-powered lights from Unite to Light, a Santa Barbara based nonprofit. The intention is to create a library where the lights will be checked out to families and individuals during their stay in the Safe Parking program. Safe Parking Program participants, who live in their vehicles, will have a light they can charge during the day and use at night. These lights also have a USB socket which can charge a cell phone or other small electronic device, without relying on an electrical wall outlet. New Beginnings Counseling Center provides quality, affordable counseling, shelter, case management and education that strengthens our community and provides our clients with the ability to lead healthy and productive lives. New Beginnings Counseling Center, located at 324 East Carrillo Street, Suite C, Santa Barbara, CA 93101, (805) 963-7777, is a nonprofit 501(c)(3) organization. For more information or to make a donation, visit www.sbnbcc.org.